Looking for a stereo receiver with more onboard music options than just the AM and FM radio bands? Then check out the Marantz M-CR611. Sure, the AM/FM tuner is there. But you'll also find a built-in CD player, wireless network capability, Bluetooth, and Apple AirPlay to extend your listening choices far beyond local radio stations. It's all underneath the hood of a compact chassis — perfect for a bedroom, office, dorm room, or den, anywhere you may not have room for separate components. With built-in Wi-Fi, the M-CR611 will wirelessly stream music even if your router isn't within reach, so you can play music from networked computers, online music services like Pandora® and Spotify®, or free Internet radio stations from around the world. Built-in Bluetooth makes it super-easy to stream tunes from a smartphone, tablet, and even some computers without a home network. Due to changes implemented by Pandora, this receiver is temporarily unable to connect to the Pandora service. A firmware update to resolve this issue is currently available. Apple AirPlay allows you to enjoy songs from your iPhone® and iPad®, or from iTunes® on your Mac® or PC. Or if you'd prefer the simple convenience of CDs, just pop one into this unit's built-in player. That's a whole lot of music choices built into a single compact component that can make your speakers sing with legendary Marantz sound. 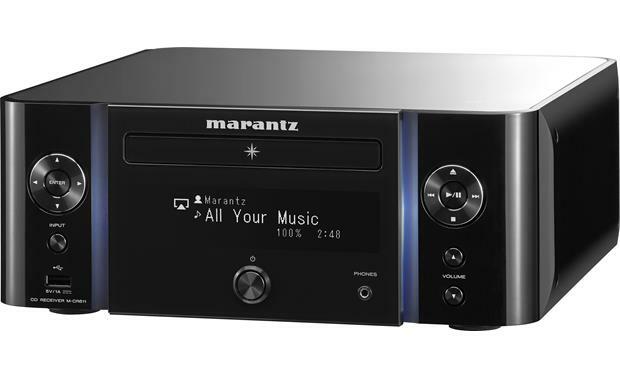 This versatile Marantz also offers plenty of inputs for your analog and digital sources, so you can connect a separate disc player or even the audio from your TV. Front- and rear-panel USB ports are perfect for mass storage devices loaded up with digital music files, including high-res audio with sampling rates up to 24-bit/192kHz, as well as DSD files. Or plug your iPod or iPhone into the front port for digital playback using this receiver's high-quality digital decoding. You'll also find aconvenient output for a powered subwoofer, in case you need to augment the bass response of your bookshelf speakers. Apple AirPlay requires a wireless home network. Very happy with my new Marantz. The sound is amazing, the features are awesome and I'm very happy with my decision. Adam, my Crutchfield rep assured me that despite the comparatively low power rating, that the unit would drive my 14 ceiling speakers. He was right! Does the M-CR611 receiver get over-the-air HD radio stations? Yes it does....it has a standard dipole antenna if memory serves me correctly. 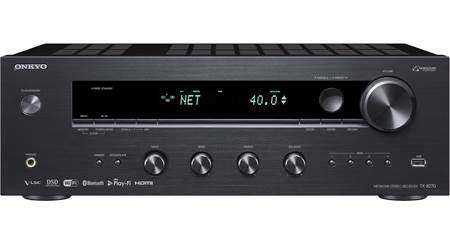 Network Connection: The Marantz M-CR611 network CD receiver is equipped with dual network connection methods. There's an RJ-45 LAN (Ethernet) port for direct wired connection to your home network, and there's also the built-in Wi-Fi feature that includes Wi-Fi Protected Setup for safe & secure connection to your wireless home network. When connected to the Internet, the device can stream free Internet Radio & music from online services (such as vTuner, Pandora, Spotify Connect, & SiriusXM). It can also connect to your home network's own music library stored on your computer, giving you remote access to your entire music collection. Ethernet: The Marantz M-CR611 network CD receiver is fitted with a Ethernet (RJ-45) port for a hardwired Internet connection. 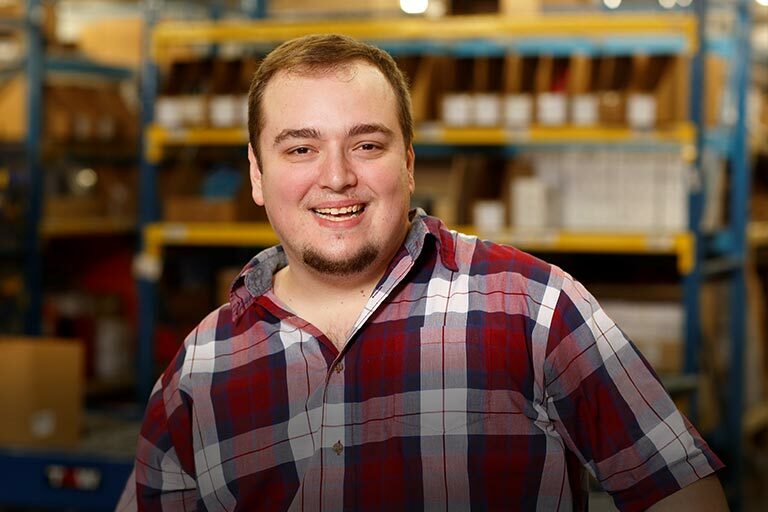 This unit's RJ-45 Ethernet port supports 10BASE-T/100BASE-TX and requires an Ethernet (LAN) category 5 or higher cable, Router, Modem, and Internet connection. WiFi + WPS: The Marantz M-CR611 network CD receiver is equipped with a built-in WiFi (IEEE 802.11b/g/n) receiver and dual diversity antenna system which allows it to communicate with your home network wirelessly. Additionally, thanks to its WiFi Protected Setup (WPS), the M-CR611 allows for easy & secure establishment of a wireless home network. When using a wireless LAN connection, your network system must feature an wireless router/access-point. DLNA Certified: The M-CR611 is DLNA (Digital Living Network Alliance) 1.5 & Windows 7/8 compliant for audio networking. This means it's easier for you to access & enjoy digital music stored on your PC or smartphone (like Android). You can use your PC or smartphone to play high-bit rate music content through your audio system, or use the M-CR611 to browse & play music files on your hard drive. A wide variety of audio files stored on your computer can be played through the M-CR611 via its wired or wireless network connection. You can control playback of your streamed audio files from the M-CR611's remote control. The receiver also supports ID3-Tag (ver.2) & META tag information so song title, artist name, and album name can be displayed the unit's front-panel display. The Marantz M-CR611 supports the following audio formats, sampling frequencies, & bit rates via its wired or wireless network connection. 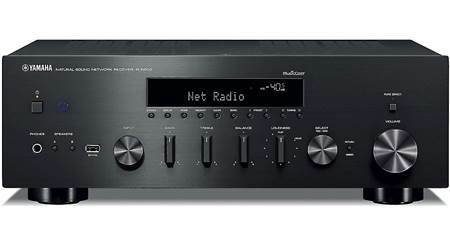 Online Services: The Marantz M-CR611 lets you access Internet Radio, as well as other online music services from your broadband Internet connection. Currently the M-CR611 supports Internet Radio from vTuner, Pandora, Spotify Connect, and SiriusXM (as of 9/2/2015). 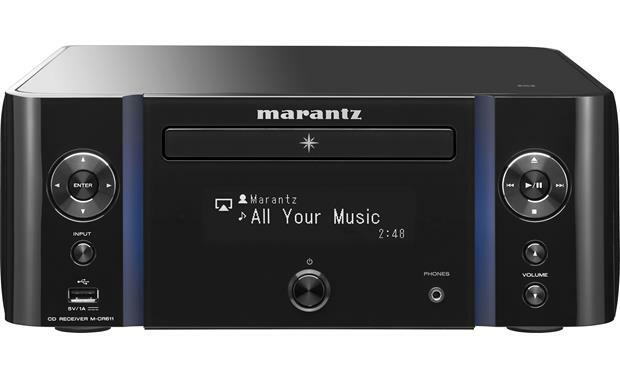 The Marantz network CD receiver offers front-panel display and control over these web services. Pandora Once the network audio player is registered with your Pandora account, you can listen to the automated music recommendation and Internet Radio service. You can create up to 100 personalized radio stations. You can sort tracks within these radio stations. You can skip up to 6 tracks that are being played back within 1 hour. You can also thumbs-up/thumbs-down and bookmark tracks. In Pandora, you can search for the track name or artist name using "keyword" searches. When the search is complete, tracks that have a similar rhythm or sound are streamed. Spotify Connect If you subscribe to Spotify Premium and have the Spotify App on your Apple iOS or Android smartphone, you can stream Spotify the Marantz network receiver. Spotify is a digital music service that gives you on-demand access to one of the largest music libraries in the world (over 15 million tracks and counting). Spotify makes it easier than ever to discover, manage, and share music with your friends. You can browse music by artist, album, track, or most popular; and create your own music library with customized playlists. Firmware Updates: Using the receiver's network/internet connection, you can check for & update the latest firmware from the online Marantz server. AirPlay Certified: AirPlay lets you stream your favorite songs directly from your Apple iOS (4.3.3+) device or from your iTunes (10.2.2+) library on your Windows PC or Mac computer to the Marantyz M-CR611 Integrated CD/Network Receiver, over your home's wireless network connection. iTunes Streaming: The M-CR611 network CD receiver is able to streaming audio from your computer's iTunes account AirPlay technology. When connected to the same network as a computer running iTunes, the M-CR611 can appear as an output option in the pop-up menu at the bottom of the iTunes window. You can then browse your iTunes collection on your computer & stream music to the Marantz network CD receiver. Apple Device Streaming: AirPlay also lets you wirelessly stream music and music apps stored on your iPod touch, iPhone, or iPad to the Marantz M-CR611. So there's no need to dock your Apple device, unless you want to charge it. Using the Apple Remote App (Free download from iTunes) on your iPod touch, iPhone, or iPad and your wireless home network, you don't even need to be in the same room as the components or your computer to play, pause, skip, and stop the songs in your iTunes music library. You will even see the iTunes music information, including your track titles & artist info on your Apple device. iPod/iPhone Connectivity: You can also connect your Apple iPod, iPhone, iPad to the network CD receiver's front- or rear-panel USB (type-A) port via the Dock- or Lightning-cable that came with your Apple device. Audio Playback: The unit supports audio playback of music stored on your iPod/iPhone, as well as from music apps streamed to your iPod/iPhone. Music Navigation: You can choose to operate your connected iPod/iPhone from the M-CR611's front-panel controls, remote control, or from your iPod/iPhone's clickwheel or touchscreen. The Marantz M-CR611 lets you browse by Playlist, Artist, Album, Song, Podcast, Genre, Composer, or Audiobook. It also offers Play/Pause, Stop, Skip/Back, Repeat, & Random functions. 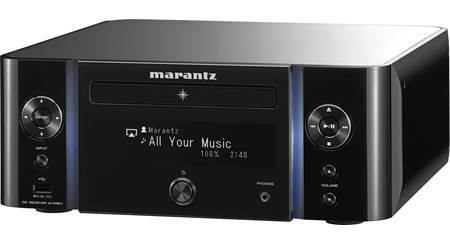 Music Information: The Marantz network CD receiver will display Track #, Elapsed playing time; as well as Song, Artist, & Album name from stored music (not music apps). You can also choose to view the music information on your iPod or iPhone. Charging: The M-CR611 will charge (5V/1A) your connected iPod or iPhone when the network CD receiver is powered on or in standby mode. Note: Apple iPod/iPhone software updates may change functionality results. If you download a newer software version, you may need to reset the device and your iPod/iPhone to regain functionality. If this doesn't work, you may need to wait until a newer software update is available. Disc Compatibility (MP3/WMA support): The Marantz M-CR611 features a built-in CD player that supports playback of CD-Audio, CD-Text, and CD-R/RW discs (12cm or 8cm). The built-in CD player supports playback of MP3 (32-320 kbps; 32-48kHz) and WMA (64-192 kbps; 32-48kHz) audio files recorded onto CD-R/RW discs in ISO9660 level 1 format. The unit can recognize up to 256 folders, with a total of 512 folders and files. Dual USB Ports: The Marantz M-CR611 is equipped with a front- and rear-panel USB (type-A) port for easy, direct connection of a USB Mass Storage Class (MSC) device or USB Media Transfer Protocol (MTP) device with audio files; such as your Android smartphone/tablet or USB thumbdrive. The front-panel USB (type-A) port supports playback of a variety of audio files recorded in FAT 16 or FAT 32 onto a USB (MSC/MTP) device. The unit can recognize up to 500 folder and 5,000 files. Note: USB devices that can be charged via USB will be charged when plugged into the unit's USB port (5V/1A). Playback Modes: You can control music playback from the network CD receiver & remote control. The Marantz M-CR611 features Repeat, Random, and Program playback modes. Program: Up to 25 track can be programmed. Song/Artist Information: The unit also supports ID3-Tag (ver.1.x/2.x) and META tag information so song title, artist name, album name can be displayed on the unit's front-panel display. Built-in Bluetooth: The Marantz M-CR611 features built-in Bluetooth (version 2.1+EDR) with support for profiles A2DP 1.2 and AVRCP 1.4. You'll be able to wirelessly stream music from your Bluetooth-enabled Apple iPod/iPhone/iPad, Android smartphone/tablet, Windows Phone/PC, Mac computer/laptop, and more to the Marantz receiver. Multi-Device Pairing w/ NFC: Up to eight Bluetooth devices can be remembered by the M-CR611, so family members as well as friends can enjoy their favorite tracks. The M-CR611 even includes NFC pairing, so you can easily pair your Android (OS 4.0+) device by touching it to the "N" logo on the side panel of the network CD Receiver. Control & Song/Artist Display: You will be able to control basic playback functions (Play/Pause, FF/RW, Skip) using the receiver's remote control. Advanced music operation will still need to be handled from your Bluetooth-enable device. Song/Artist information is displayed on the receiver's front-panel LCD. Note: Due to the differences in Bluetooth technology, some Bluetooth enabled devices may be incompatible, function improperly, or may not support all features when used with the Marantz network CD receiver. Marantz HiFi Remote App: The Marantz Remote App (from Apple's App Store or Google Play) lets you control the Marantz network CD receiver using your Apple iOS (7.0+) or Android (4.0+) device. This free-to-download app allows you to operate the network audio player using your mobile device's touchscreen, giving you complete control over playback functions & source selection. You can even search your network source's music libraries from your Apple iOS or Android device. Basic Functions: Control basic functions of the network CD receiver like power, volume, input, and settings. IR Remote: The Marantz M-CR611 includes an IR remote control for wireless operation of the network CD receiver, Internet Radio, online music services, stored music files on your computer, Bluetooth audio, and a connected iPod/iPhone. Web Control: You can control this unit from a web control screen on a web browser of your Windows PC. The M-CR611 and your PC must be connected to the same home network. Digital Amplifier Technology: There are four 25-watt digital amplifiers that deliver clear audio with lowest distortion, and the amplifier section can be configured a number of ways. You can connect a single pair of speakers, and the system can output 50-watts per channel. You can also connect a pair of bi-amp compatible speakers. In addition, you can connect two pairs of speakers for different rooms with the ability to have one or both pairs operational at the same time (same source in both rooms). Stereo Bi-Amp Operation: A bi-amp connection is possible with speakers that have two set of inputs by combining the receiver's A & B speaker connections. This allows you to drive the treble and bass drivers of a speaker with separate amplifier channels, which enables better sound quality. A & B Speakers: Speaker A & B mode allows for two pair of loudspeakers in different rooms with the same source playing in both. The volume of each pair of speakers can be adjusted individually. Audio Settings: Independent Bass (100Hz) & Treble (10kHz) adjustments (+/-10dB) emphasize low and high frequencies. The Dynamic Bass Boost (DBB) function emphasizes the system's bass output by +8dB around 100Hz. Source Direct (S.Direct) provides playback of audio in its original form, without any tone processing. 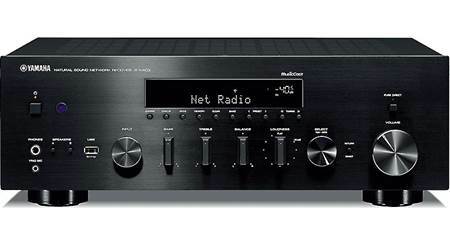 Audio Inputs: The Marantz M-CR611 network CD receiver is fitted with analog (stereo RCA) & digital (optical) audio inputs to connect to connect to a variety of home audio devices. Analog Audio Inputs: The Marantz M-CR611 features two sets of gold-plated stereo analog RCA inputs to connect your external analog audio devices, such as a game system or Tape deck. 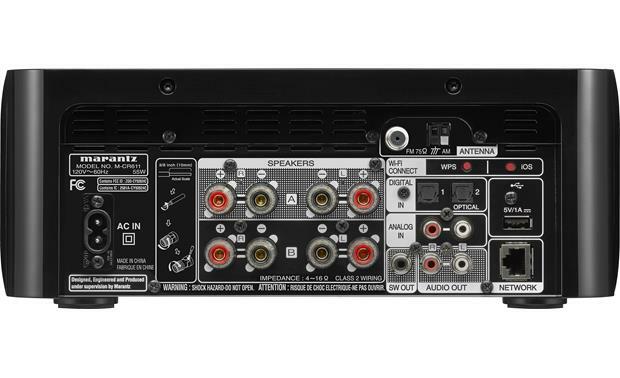 Digital Audio Input: The M-CR611 features two optical (toslink) digital inputs to connect your external digital audio devices; such as your Blu-ray player, cable/satellite receiver, and/or TV. This digital inputs will only support 2ch linear PCM signals (not Dolby Digital/DTS) between 32 to 192kHz. Audio Outputs: The Marantz M-CR611 network CD receiver features binding post speaker terminals, a single subwoofer output, and a front-panel headphone jack. Binding Post Speaker Terminals: The network CD receiver is fitted with four binding post speaker terminals which will accept bar wire, pin-connectors, and banana plugs (dual or single). The receiver will support a pair of 4- to 16-ohm speakers. Subwoofer Output: The Marantz M-CR611 features a mono-RCA subwoofer output to connect a powered subwoofer for added bass response. The sub output is linked to the Speaker A output (not Speaker B). Audio Output: A stereo audio outputs lets you connect the M-CR611 to an external integrated amplifier. Headphone Jack: When headphones are plugged into the 3.5mm headphone jack on the front-panel, all the speakers are automatically muted. Speaker Setup: The M-CR611's Speaker Setup menu lets you match your speakers and their location to the Marantz Integrated CD/Network Receiver. Five types of settings can be selected. A different setting can be selected for Speaker A & B. Response 1: Cuts low frequencies of 40 Hz or under by -12dB/oct. Response 2: Cuts low frequencies of 60 Hz or under by -12dB/oct. Response 3: Cuts low frequencies of 80 Hz or under by -12dB/oct. Response 4: Cuts low frequencies of 100 Hz or under by -12dB/oct. Flat: The crossover is set to flat. AM/FM Tuner: The Marantz M-CR611 is equipped with a built-in AM/FM tuner with excellent sensitivity to pull in those weaker signals. You can store up to 50 of your favorite AM/FM radio stations. You can do this manually, or have the integrated receiver do it automatically for you. You can give each preset station (up to 50) an 8-character name, so it can be easily indentified. The Marantz M-CR611 comes with an external AM loop antenna and external FM wire antenna. The unit features spring-clip terminals for the AM antenna and a push-on coaxial connector for the FM antenna. Compact Aluminum Cabinet: The Marantz M-CR611 features a stylish, compact, high-gloss black cabinet. At just 11.5" (w) x 4.4375" (h) x 12.5" (d), the Marantz M-CR611 fits almost anywhere. Favorites: The Favorite function allows you to register your favorite broadcast stations and files in a Favorite List in advance, so that you can recall them and listen to those stations or files whenever you want. You can register Internet radio stations, music server files, and tuner presets as favorites (up to 50). Gapless Playback: The M-CR611 supports Gapless playback for WAV, FLAC, ALAC, AIFF, and DSD 2.8MHz music files, so there are no gaps between songs. Organic Electroluminescence Display (OELD): The Marantz M-CR611 uses a high-contrast, 3-line organic electroluminescence display (OELD). The display's brightness can be set to 100%, 75%, 50%, 25%, or Off. Alarm Clock & Sleep Timer: When this unit is connected to the Internet, the current time is set automatically. You can set an "Every Day" or "Once" alarm. Use the "Sleep Timer" function to automatically switch the unit's power to the standby mode after a specific amount of time. The sleep timer can be set up to 90 minutes, in steps of 10 minutes. Auto Standby: This unit will automatically enter the Standby Mode after approximately 1-99 continuous minutes of no operation. As far as I know it cannot, but I may be mistaken. There probably are no HD radio broadcasts which can be received here. There seems to be no mention of HD radio in the owner's manual. This a very good piece of equipment and came to life with ease. It is on an Ethernet and not WIFI. It does receive am/fm. A small indoor antenna is included which attaches with a standard coaxial cable. There is not much this unit does not receive. I am extremely happy with the amount of options this unit provides. No but get gets WiFi radio which is really great. I love this recicever! has this received the necessary pandora upgrade and is it Airplay 2 compatible? Airplay is buggy ... yes it can support Pandora. can I hook up a turntable? Yes, but it will need a phono pre-amp since the analog inputs to the M-CR611 do not have a phono pre-amp. I use a TEAC TN-300 turntable which has a built-in phono pre-amp which can be switched on or bypassed. Can I rip my cds on to my computer using this player? With Bluetooth? Is M-CR611 build in DAC? The M-CR611 will take digital streams from the Internet and will connect with a digital source like a computer. Marantz/Denon make purpose built DACs if that is what you really want. I only use my M-CR611 to stream Internet radio feeds and it works great either on a wired or wireless network. I would not go back to over the air radio. Will the Marantz automatically turn on when an audio signal is detected?. For example from my tv optical audio output to the marantz optical audio input. While I have not used the Marantz in the same way as you, it does turn on automatically when I use airplay to send music to it. Therefore, it is always on waiting for a signal even when the switch is off. No, not by my experience, unless I've missed a feature of this unit that I otherwise like. I do run my TV audio through the stereo, but generally need to switch the stereo from FM or CD to "Analog In", anyway. I also need to adjust the volume, which needs to be bumped up 6 levels versus FM or CD mode. All that has become second nature for me now. How many CDs can be put into this at one time in the Marantz MCR 610 or 611? 1 only! IMHO, less moving parts means less chance of mechanical breakdown. If you need long term music use a Bluetooth device/phone app.....or if better resolution is desired, purchase a HIghRes audio player and listen to that as it sounds phenomenal with this unit pushing some excellent speakers. Control via web app is pretty awesome, especially if behind a cabinet....pricey, but worth it for me! One. It cannot hold multiple discs. can the alarm clock function use siriusxm internet radio? Is the Marantz M-CR611 compatible with 4ohm Speakers like the Martin Logan Motion 4? I really cannot say for sure about the Marantz receiver. I am driving the Motion 4 speakers with an OnkyoTX-NR 626 without any problem. I have never bought a speaker based on its ohm rating to match to an amp. I believe that your effective power output will simply be somewhat higher with the lower 4 ohm load vs. the 6 ohm power rating in the Marantz specs. Hope this helps! Searches related to the Marantz M-CR611 Desktop network receiver/CD player with Apple AirPlay®, Wi-Fi®, and Bluetooth®.